The Information on this picture is quite extensive. In short after a year long break of role playing from the old hang out in #fanfics-rp I was toying with the idea to RP a Corpse Hearder loosely based off of Tao Jun from Shaman King. After discussing the character and the terminology, with some fellow RP players on IRC I was invided to make a character representation of "myself in anime form, with said unusual powers." Within the Shaman King Fandom. Hair blackish brown.Primary Fandom: Shaman King. 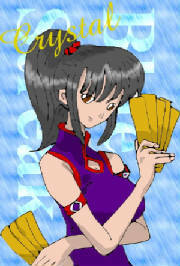 Physically: Is currently training in Tai-Chi. Information. In the year of 2005 Crystal’s mother died of Cancer. This had caused her to go into a deep depression and disappear from the face of the earth as she mentally healed herself. A year later her Father, married into the Tao family Clan. It was then that Crystal had become aware of an ability to see dead people. At the time though she was uncertain if she were crazy or not. Her Step mother Tao-Li learned of this ability, and took it upon herself to tell Crystal just what she was really capable of. No sooner had it been learned what Crystal could do.. An Uncle came to Winnipeg and taught her how to be a corpse herder, and bestowed upon her, on her 24th birthday the perfectly preserved dead body or Jaing-Si of Lang. A warrior from the Chinese Dynasty that once served the Emperor of China. He then sent her off to Japan, to try her luck at taking part in the Shaman Fight in Tokyo. However, she was un successful of landing the one single blow and was not able to enter. During the rest of her stay for the year, in Japan things happened. She was forced into an arranged marriage via Grandfather Tao, to Shang-Lo a fifty year old Shaman, who upon first appearances was a ‘friend of the family’ but had some other dealings that the Tao’s did not know about, or if they did they did well to cover it up. Crystal not being one for such political movements in families, with her step mother backing her with a trusted friend Li-Fa, and several friends at the Sakuraba Summer house (Ai Yori Aoshi) came up with a plan to hopefully prevent the unwanted marriage. However, the plan went afoul. The Man Shang-Lo had her kidnapped. When she was found she was in a catatonic state, and when she came to she had no memories of people except fragments. It was soon after that she left Japan For Home. Winnipeg. All Content here, be it art, or a character is Orginal, unless other wize stated.